For many people the first visit to a new health care provider is a step into the unfamiliar. Please allow us to give you an outline of what to expect. Your first visit will allow us to gather as much relevant information about you as we can in order to determine how we can best serve you. This visit may take up to 45-50 minutes, so please allow enough time. We also ask that you dress comfortably for the examination; we recommend that women bring a sport bra or tank top. Please bring a copy of any past CTs, MRIs, X-rays or other relevant test results. Following the paperwork, you will meet Dr. Lowthian to discuss the relevant details of your health. In order for us to gather a complete picture we may ask questions regarding previous injuries, postural habits, sports, medication usage and results, diet, repetitive stressors, etc. If we feel that your problem is outside of our expertise we will let you know. Following our consultation, we will then begin our exam. Various movements, palpation (touch), and other relevant testing procedures are used to determine which part of your body is responsible for generating the discomfort you are experiencing. Your body is a ‘chain link’ system, and we will look for all the contributors towards your particular symptoms. Some or our tests may reproduce your symptoms and some may also provide relief. We will also ask questions and use procedures to rule out serious disease and pathologies that may need to be treated elsewhere. X-rays are sometimes needed to assess, and help diagnose certain conditions. 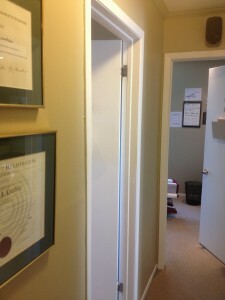 If they are needed, we will refer you to an X-ray facility to have your films done in a timely manner. Following the examination, we will review with you our findings as soon as we can and begin care. See Our Care for more information.